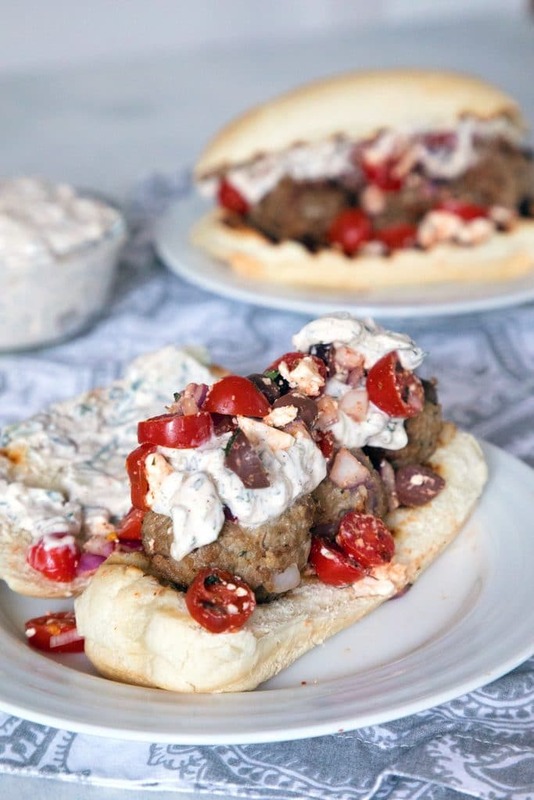 These Greek Meatball Subs with Spicy Tzatziki will satisfy all of your Greek food cravings. 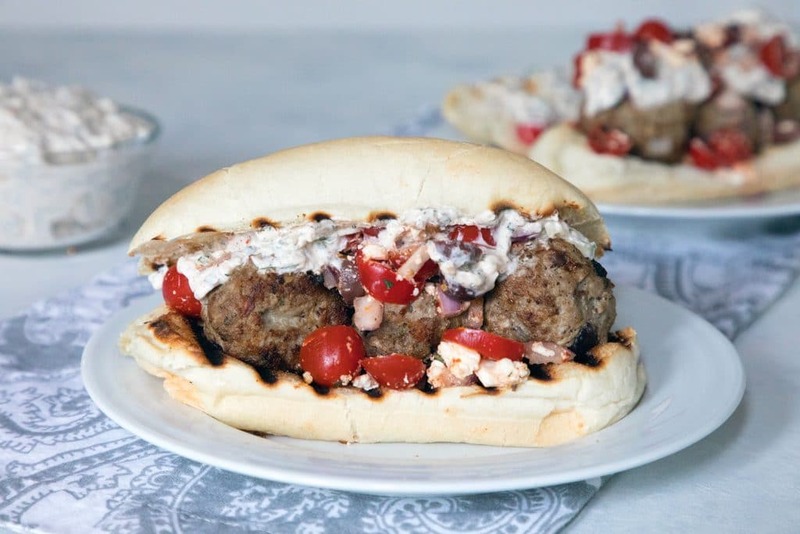 The lamb meatballs are packed with kalamata olives, red onion, feta cheese, and mint and the spicy tzatziki has the perfect kick. Do you love or hate going to the grocery store? I have majorly mixed feelings about it. I think that in another life, I would LOVE the grocery store. I’d get so much joy in strolling up and down the aisles, browsing the new products, dreaming up fabulous new recipes, and conducting some major price comparisons. But in my current life, going to the grocery store is such an inconvenience and it just doesn’t feel good to spend my precious free time there. 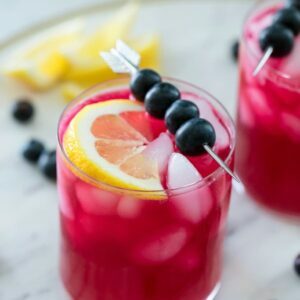 I try really hard to go right after work on Fridays because a) it’s less crowded and b) if I’m working on weekend recipes for the blog, I can have everything I need AND can relax a bit on Saturday morning. 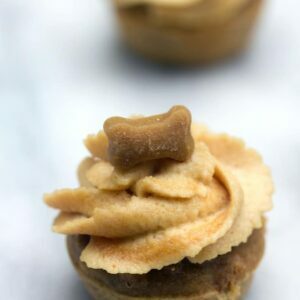 But quite often, I am not able to finish my recipe planning by Friday and am stuck going over the weekend. When it’s crowded and time is short and grocery shopping is the last thing I want to be doing. Lucky for me, I have it down to a total science and can get from my garage and back, conducting a full grocery shop, in just under an hour. Add on 10 minutes if I have to stop at the liquor store, too. On Sundays, I love cooking the kind of meal that will give us some lunch leftovers going into the week. These meatball subs definitely fulfilled that need. Meatball subs are one food that I’m pretty much always in the mood for. The same goes with any and all things Greek. Kalamata olives, feta cheese, and tomatoes are never a bad idea. I combined my loves into Greek Meatball Subs with a Spicy Tzatziki. 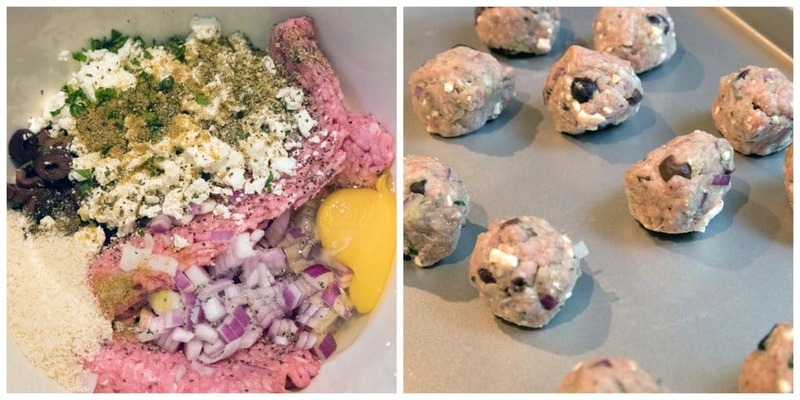 Into the meatballs went ground lamb, red onion, feta, kalamata olives, and plenty of garlic and mint. And into the tzatziki went cucumber (duh), jalapeño peppers, and lots of mint and dill. I toasted my sub rolls (essential!!) and then slathered (I can’t decide if I love or hate that word, but I’m going with it) the tzatziki on. Three meatballs were laid on top and then I layered more tzatziki on (because why not!) and then sprinkled with a Greek salsa I made with tomatoes, kalamata olives, red onion, feta, and oregano. Yes, I am a very, very happy camper. I was going to say, “I don’t know what it is about Greek food that makes it so good,” but I do. I mean, it’s mainly the feta cheese and kalamata olives. Right?? OK and all the fresh veggies. And lamb. I love lamb. 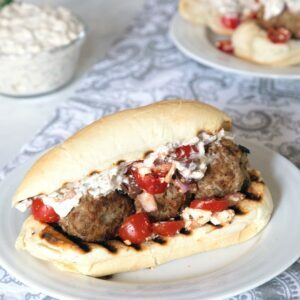 These Greek meatball subs are my dream, but the lamb meatballs would be delicious served in a variety of ways. Even if you were simply to put them atop a salad. 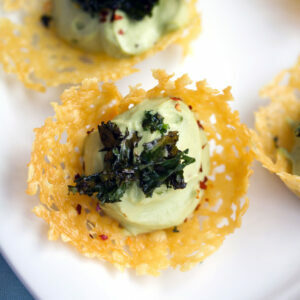 Or eat them plain with a little spicy tzatziki dipping sauce. The Greek salsa would also work with a ton of different summer meals and would even make an awesome tortilla chip dipping salsa. When I end a Sunday with a meal like this and plenty of leftovers packed away in my fridge, I am a happy girl. It makes the pain of the grocery store trip a little bit more bearable. Bonus points to me if I also cut up veggies and clean and bag fruit for a week of lunches. My week is so much happier! Do you love or hate going to the grocery store? In a large bowl, combine the first 10 ingredients (from lamb to salt) and using your hands, mix well to combine. Form mixture into about 12 round meatballs and place on a baking sheet. Add 1 Tbsp olive oil to a large skillet over medium heat. Add half the meatballs to the skillet and cook, turning occasionally, until browned on all sides, about 6-9 minutes. Remove to a paper towel-lined plate. Repeat with second batch, adding more olive oil to pan if needed. Using a box grater held over a kitchen towel, grate 1/2 the cucumber. With the towel held over the sink or a bowl, squeeze as much excess water as possible from the cucumber. Finely chop the remaining half of the cucumber. In a medium-sized bowl, combine Greek yogurt, lemon juice, jalapeño, minced garlic, chili powder, dill, and mint. 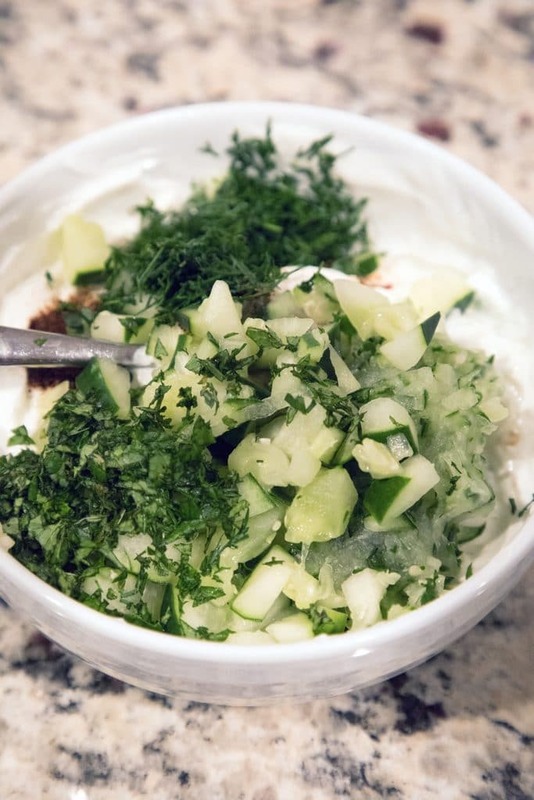 Fold in grated cucumber and chopped cucumber and let tzatziki chill in fridge for at least an hour before serving. 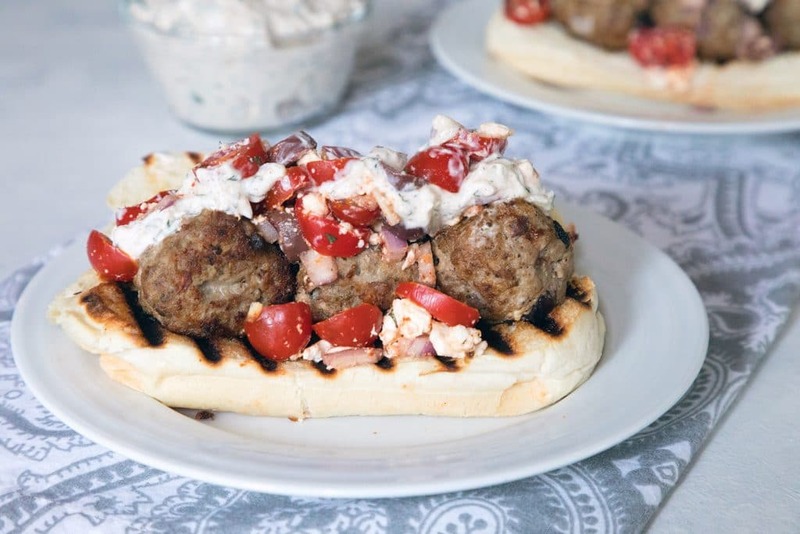 Spread spicy tzatziki on sub rolls and place three meatballs on top. Spoon Greek salsa over the meatballs and add more tzatziki on top, if desired. 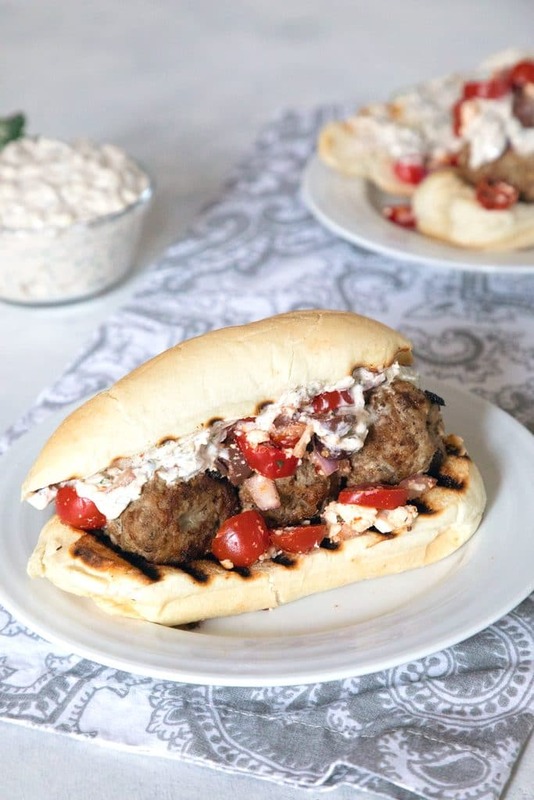 14 Responses to "Greek Meatball Subs with Spicy Tzatziki"
YUM! What a great idea! 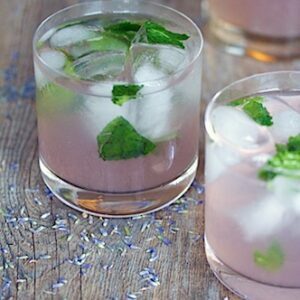 The Greek-ness makes it feel lighter & Summery! I used to hate grocery shopping, but really it was the crowded aisles & parking & carrying stuff up 3 flights. Now that I’m in the burbs I love it. Delicious sub Sues…I am loving the meatballs loaded with the tzatziki sauce,,,what a delicious meal! These meatballs look delicious, I love the look of that greek salsa! I hate going to the grocery because I go so often! But I love Greek food and these subs look divine! I’m loving all these Mediterranean flavors and with leftovers too, this is a great meal! I do the same, cooking on Sundays for leftovers during the week! Look at those beauties! My mouth is watering. Great combination of flavors & textures in this tasty sub. I have the same love-hate relationship with the grocery store. Sometimes i love it, but if I’m just zooming through trying to get stuff to make for the week/blog, it’s just another errand lol. These subs sound soooo good, I’m obsessed with Greek food! haha yeah I am that person who goes to the grocery store crazy early on saturday morning to avoid the crowds! I am a huge sucker for anything with greek flavors – these sound awesome!